“Unfortunately, Fitchwick, these marsh people refuse to recognize any authority. They claim to have some ridiculous charter from some old king granting them independence.” So complains an officious Ministry of Agriculture bureaucrat about the people living in a remote English village. It seems that hundreds of years earlier, the founders of this village reclaimed land from the sea by building dikes, and in reward, the king at the time gave them partial legal independence. At the time when this story begins, the central government no longer respects that independence, but the people themselves haven’t forgotten it. So, when bureaucrats from the Ministry of Agriculture arrive to “advise” the local farmers on how to improve their “disgraceful” level of productivity, they find a shocking degree of resentment and uncooperativeness. In one scene, a farmer expresses exasperating indifference not only to their advice, but also to the whole concept of improving his productivity. In another scene, a farmer literally drives the officials off his land with a pitchfork when they try to tell him how to run his farm better. Everywhere in this town, the bureaucrats encounter nothing but indifference and hostility. Finally, when they try to seize a wrecked ship that they (correctly) suspect of being used to smuggle untaxed liquor, the local magistrate arrests them for trespass and subjects them to a lengthy and intimidating trial. Smuggling, as it turns out, is the major industry in the area, hence the lack of interest in comparatively unprofitable farming. In the end, faced with a nearly universal lack of cooperation on the part of the locals, the frustrated officials give up and leave. What a delightful story! 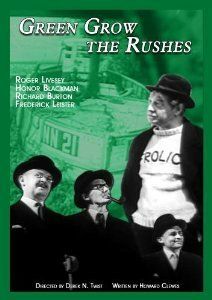 This wonderful British comedy is full of interesting characters, many played with great style. Honor Blackman, in particular, is charming as a headstrong, fearless reporter opposite her beau, a young Richard Burton. Green Grow the Rushes is a terrifically amusing film and a gratifying example of what widespread civil disobedience can achieve.